Peas are the perfect vegetable to grow in container gardens. They grow quickly and don’t need much attention. They do need full sunlight and the soil needs to be kept moist. Peas prefer cool conditions, so plant them early in the season. When it gets too warm, they stop producing. Once they do stop, you can pull them up and start another vegetable in the same container. Snow Pea, "Oregon Sugar Pod"
Cut a piece of plastic screening, big enough to cover the hole in the bottom of your pot. If you don't have screening, you can also use a coffee filter or a piece of paper towel. If your container is very large, you can fill the bottom third with clean plastic containers, soda bottles or anything that will take up some space but won't impede water flow. This can save you money on ​potting soil and make your container lighter. If you do fill the bottom, separate your soil from your filler by cutting plastic screening and putting it over your filler before you add potting soil. This trick makes clean up at the end of the season much easier. Even though lots of people will tell you it helps drainage, don't put gravel in the bottom of your pot. Fill your container with potting soil, making sure to leave at least 3 inches to the rim. If your potting soil doesn’t have fertilizer, mix some in, though peas don’t need much. If you use too much fertilizer, the nitrogen (a common ingredient in most fertilizers) will harm production and you will get great big pods with small or no peas. Even out the soil in your container and pat it down gently so that it is pretty flat, but not compacted. Though you don't have to, inoculating peas your with a legume inoculant will give you a bigger pea yield and healthier plants. Also, for faster germination, you can soak your peas in water overnight and then while they are still wet, shake them in a bag with the inoculant. Sprinkle peas generously and evenly onto the surface of the soil. With the flat part of your hand, press them onto the surface of the soil. Then, add an additional 1 to 2 inches of soil on top. Make sure not to add more soil than that, or the peas might have trouble germinating. Water deeply with a watering can with rose attachment or a hose nozzle set for gentle. 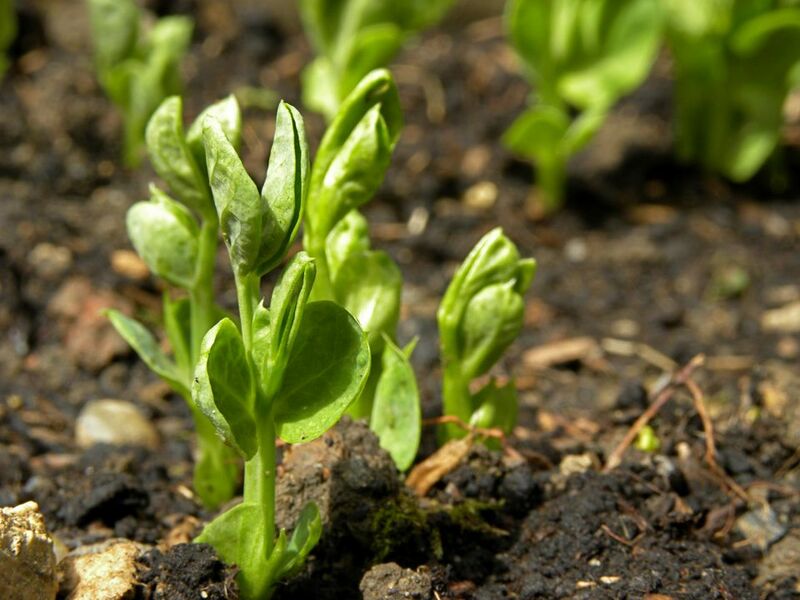 You'll want to keep your soil moist, not wet, and be sure that your peas are getting full sun. Most peas are climbers, so you will need some type of trellis. Bamboo stakes tied together with twine, in a teepee shape, will also work well. As your peas start to grow, you may have to help get them started climbing on your trellis. Harvest peas as they ripen. For the sweetest and most tender sugar snaps, harvest them when they are young. When harvesting English peas, wait until the pods swell, letting you know that the peas inside are big and juicy. You'll want to pick snow peas before the peas get too large.